The Alpha Pad is the newest product from the Signotec development department. It differs substantially from his two brothers “Sigma” and “Omega”. That affects not only the size, but rather the technology regarding to capture the coordinates of the pen and even the parameters for processing. 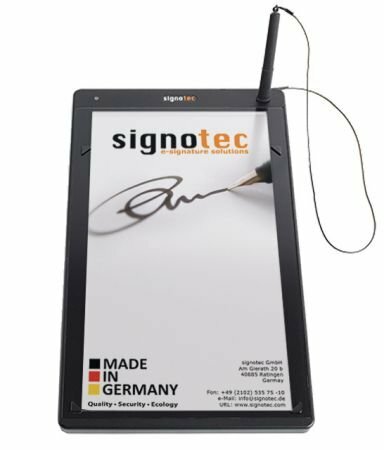 Thanks to its display size of 15,6″ it is the only Signature Pad on the market, which has the ability to display A4-documents in their original size. In doing so its not just a monitor extension, but rather a “real” Signature Pad like Sigma and Omega with the same powerful free of charge programming interface. The signee places the original document on the Pad and then signs both, the original and the digital document, simultaneously via digital blueprint. If the paper document is not required as a result of the principle of freedom of contract, the ballpoint pen cartridge can simply be replaced with a plastic one. It is then possible to electronically sign full-page documents directly on the high-resolution display. To make the displayed content remain private, the Device is provided with a “privacy viewing” technology. Thanks to that the content is protected against prying eyes. The Pad stands out through its plane surface, consisting of hardened mineral glass. To attach further devices, there are 2 USB-ports on the back of the device. You are able to “print” documents directly into your Pad and sign them on the spot. The signature is going to be placed exactly on the same position in the electronic document as on the pad. So there is no need of configuring signature boxes. The Alpha is going to be connected via USB or Ethernet. So it can directly be used on the PC or in the LAN. Of course there is also an Alpha version for a terminal server environment. If the Pad is not in use, it´s also suitable as an excellent advertising medium for slide shows, thanks to its huge internal storage which also caches statistic content. A further advantage is the open VESA-bore, located on the back (VESA MIS-D 100C, 100x100mm) for easy mounting.